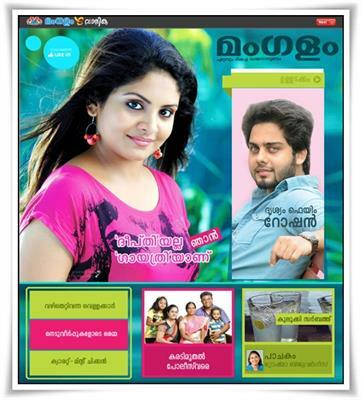 Mangalam Varika, one of the most circulated malayalam weekly in Kerala is well liked by the reading community. Each issue of this weekly covers short stories, jokes, recipes and more entertainments. Being the most popular printed entertainment publication in malayalam language, 'Mangalam Varika' is packed with interesting stories which would keep its readers intact. Mangalam, a dominant name among the people, can be credited for developing a reading culture in Kerala. Mangalam, along with other popular newspapers sow seeds to the reading habit of different generations. Mangalam Varika, one of publication from Mangalam is the most circulated weekly in Kerala. Each issue of this weekly covers short stories, jokes, recipes and more entertainments. Being the most popular printed entertainment publication in malayalam language, 'Mangalam Varika' is packed with interesting stories to keep the readers intact. Along with the printed copies, digital version is also available which is being widely used by the online users. Cartoons, utility columns and other regular stories keep the readers engaging till the last page. This weekly entertainer is graced with stories of children, cinema section, recipe sections, original personal stories, and interviews of famous personalities. Each issue of Mangalam Varika will have an exclusive article of a blessed celebrity who is well admired among the mass. Open hearted interviews with popular film stars would enable the readers to know the inner side of their favourite actors. Insightful articles written by professionals and experts give motivation and encourage the readers to carryout social activities more enthusiastically. Socially relevant writings published in the weekly are worth for reading. Specially arranged news and film bits are very interesting while the readers get updates on the happening in the society and various fields. As each issue of 'Mangalam Varika' is creamed with inventive content, it gives much refreshment from top to bottom. As the weekly comes at an affordable price tag acceptable for the common man, it reaches more hands. Mostly, this weekly is favourite among teenagers, homemakers and not-so-highly educated women in the state. 'Manglam weekly' is highly recommended to passionate readers those who want to keep freshness and be cheery always. It will be the perfect choice for those who wish to keep them unsullied for a whole week.